Just a few blocks away, at the intersection of Washington and Summer Streets, thousands of people walked through the bustling Downtown Crossing neighborhood from retail store to retail store. They funneled down side streets from Boston Common, exploring small specialty shops and searching for places to rest and grab a bite to eat, pausing for a minute to enjoy street performances by local artists. Although you wouldn’t know it today, as recently as 20 years ago, Downtown Crossing was hardly an attraction at all. It was a place occupied almost entirely by shoppers and office workers. The neighborhood was busy during the day, but went silent at night. Now, emerging retail giants, new restaurants and revived forms of entertainment keep visitors busy deep into the night. The Downtown Crossing train station is one of the most heavily-used MBTA stations in Boston, serving an average of 23,478 passengers daily in 2015. The addition of high-rise, million-dollar condominiums are giving the area a residential feel. If Downtown Crossing isn’t the obvious first place to visit in Boston, it’s at least in the conversation. Tourists and Boston residents alike flock to the neighborhood for its shopping, food and entertainment. Downtown Crossing is one of Boston’s pedestrian-only zones. Photo by Ronnie Zhang. In the early 1900s, Temple Place in the heart of Downtown Crossing could have been considered the Fifth Avenue of Boston. The street was famous for its shows and women’s fashion. But the neighborhood took a nosedive after World War II, becoming a place that was lonely and desolate after dark, despite the daytime shopping bustle. Foot traffic and business in the neighborhood slowly declined throughout the years. By the turn of the millenium, once-great commercial retail institutions, like Jordan Marsh and Filene’s had closed their doors. For years, retail spaces of out-of-business department stores remained vacant, easily noticeable while walking in the four-block pedestrian-only zone. Over time, the gutted interior of the historic Filene’s building – which closed in 2006 – became a symbol of decline in Downtown Crossing. 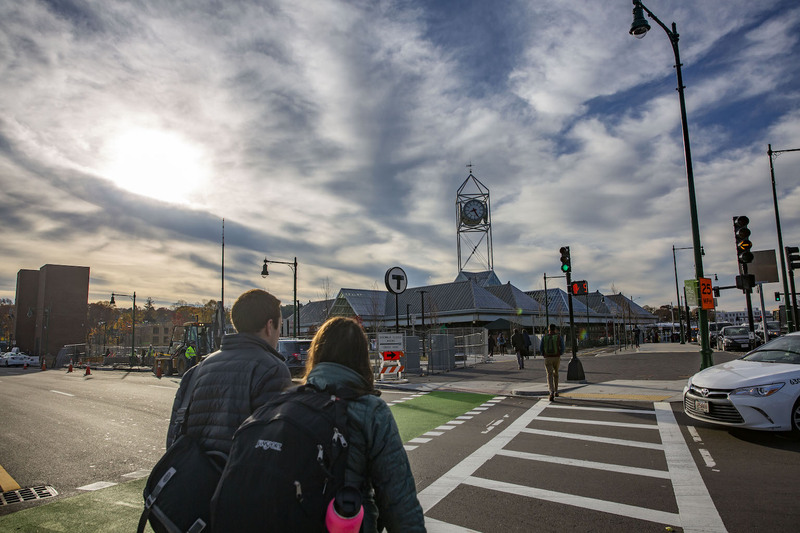 In 1996, David Ertischek, who now works for the Boston Improvement District (BID) – a non-profit organization set up by local property owners to transform and engage Downtown Boston – was entering his freshman year at Emerson College. “[Emerson] told me not to come to Downtown Crossing,” said Ertischek, explaining that crime rates in the neighborhood were high. 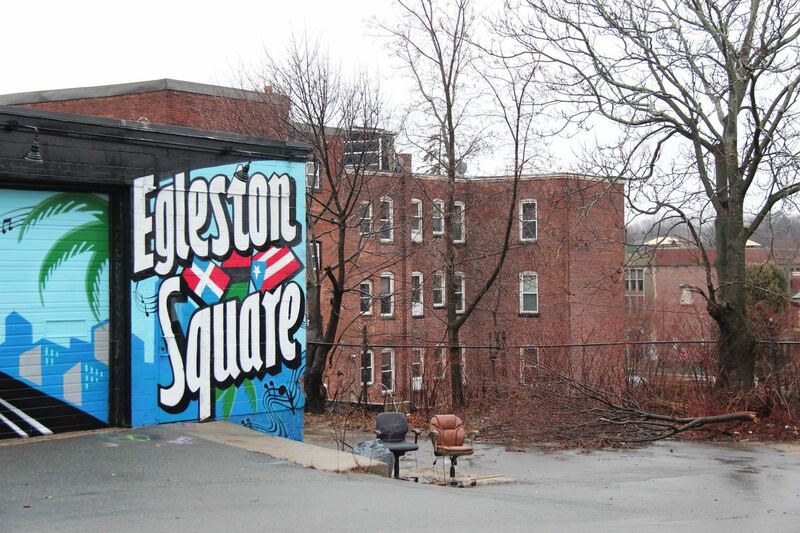 Now, decades later, Emerson has embraced its place in the neighborhood. The defunct department stores have been replaced by some of the world’s largest retailers. Macy’s bought out Jordan Marsh in 1996 and has been on Washington Street for the past two decades. The European giant Primark established its American flagship store 400 feet away and Old Navy moved in next door. In 2013, Filene’s basement, which was once a literal hole in the ground, was filled by Millennium Tower, a 60-story skyscraper with offices and luxury condominiums. In 2013, Millennium Tower, prominent in the Downtown Crossing skyline, filled the Great Hole and became the third tallest building in Boston. Photo by Ronnie Zhang. In the span of a couple blocks in Downtown Crossing, retail giants and small, local novelty shops can be found nestled side by side. Along Bromfield Street, local skate shop One Gig brings in customers from all over the world but cultivates a small-town vibe, promoting local artists with its apparel, custom skateboards and fashion. A few stores up is Bromfield Pen Shop, the last remaining pen specialty store from the 1950s. And the famous Brattle Book Shop, first established in 1825, has been located at 9 West St. since 1984. Brattle Book Shop survived through the Great Boston Fire. 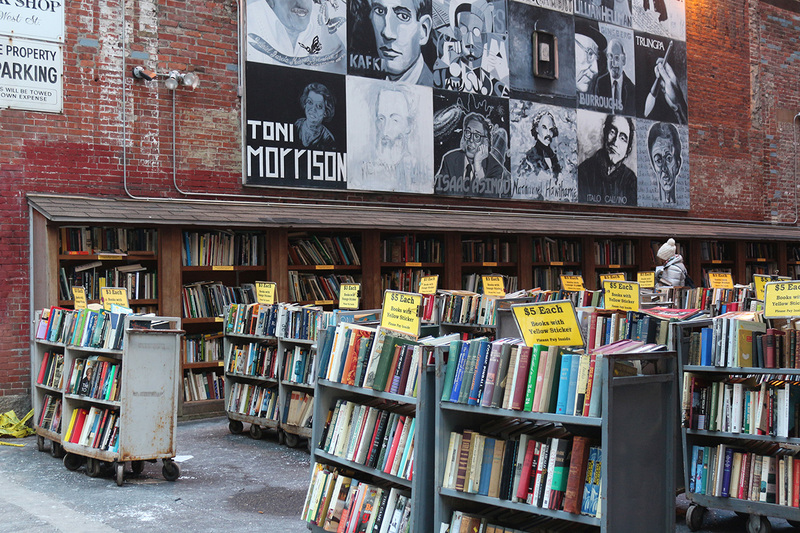 Its old location, popular with Instagram photographers, is now being used to keep cheap books. Photo by Ruobing Su. Stoddard’s Fine Food and Ale is the most recent business to occupy the historic Stoddard building, constructed in 1868. The Greek revival-style structure at 48 Temple Place is one of the oldest buildings in Downtown Crossing. It has become a symbol for the resurgent neighborhood. The renaissance of the neighborhood has made the area prime real estate for restaurants, which is increasing competition among businesses. Jamie Walsh, co-owner and operator of Stoddard’s, compares the evolution of Downtown Crossing’s restaurant industry to the one in Fenway. There, restaurant owners can attract hundreds of thousand of people per night during baseball season, but struggle to attract customers outside of those 81 home games every year. The same is beginning to happen in Downtown Crossing, where the sheer amount of dining options to choose from is thinning the clientele at each business. 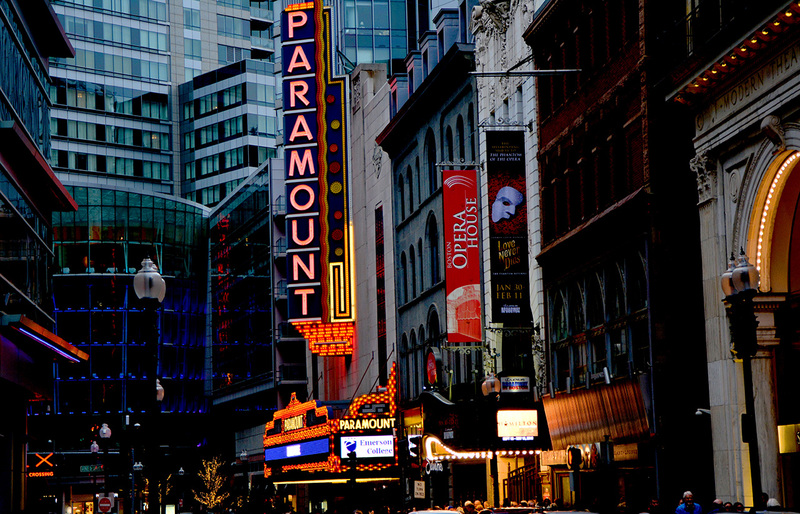 Outside of shopping and dining, what attracts many Bostonians and tourists to Downtown Crossing is theater. The beautiful Boston Opera House on Washington Street, first built in 1927, was renovated in 2002 after it fell into neglect when the opera company that owned it went bankrupt and closed their business in the early ’90’s. The Boston Opera House now runs one of the busiest theater schedules in New England, with the Boston Ballet and the Broadway Across America as its two primary tenants. In a similar manner, the Wilbur Theatre, a Federal Revival style building on Tremont Street, was originally built in 1914 and was refurbished in 2008 by a former owner of Comedy Connection. In 1983, Emerson College purchased what is now the Cutler Majestic Theater, also on Tremont Street, after it fell into disrepair. Renovations were completed in 2003 and the theater has since won several awards and has been named a Boston Historic Landmark. And Suffolk University’s multi-million-dollar investment to refurbishing and reopening Modern Theater on Washington Street in 2010 contributed to what is now a burgeoning entertainment row. At night, people from other parts of the city come to the area to grab drinks and enjoy leisure time after work, making the neighborhood lively and charming until Boston falls asleep. Paramount theater attracts hundreds of visitors every day. Neighborhoods throughout Boston all have their own distinct demographics. But Downtown Crossing prides itself on being a place that has a little bit of everything for everyone. Just a few blocks away along Washington Street, Chinatown is experiencing similar changes to Downtown Crossing. A community rich with tradition derived from its homeland, Chinatown is quickly being transformed by gentrification. Rent prices are swiftly rising, both commercially and residentially, causing business owners and residents to reconsider calling the neighborhood their home. 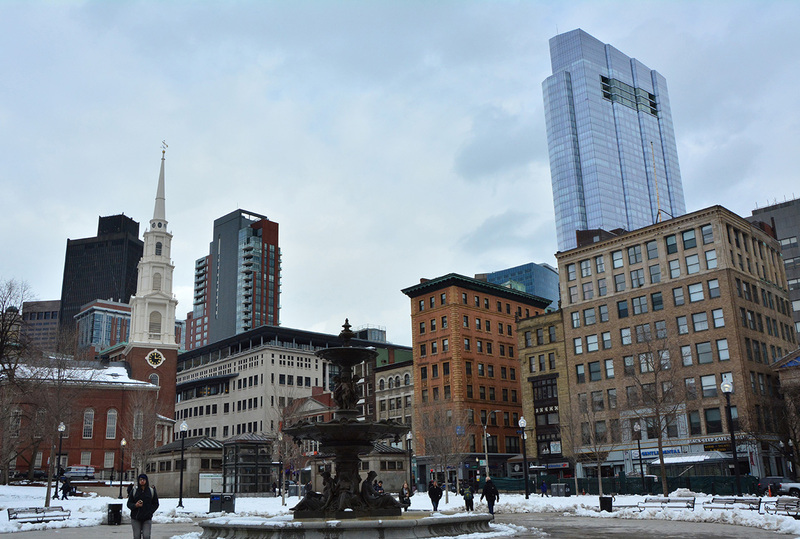 Since 2000, construction of luxury housing like the Ritz-Carlton and Millenium Place has brought an influx of new residents to Downtown Crossing as well. According to the Boston Planning and Development Authority, the population of Downtown Crossing increased 44 percent from 2000 to 2010, compared to a 4.8 percent rise citywide. While Downtown Crossing is prospering like never before, drugs, crime and homelessness, all serious issues that plagued Downtown Crossing in prior decades, still persist. 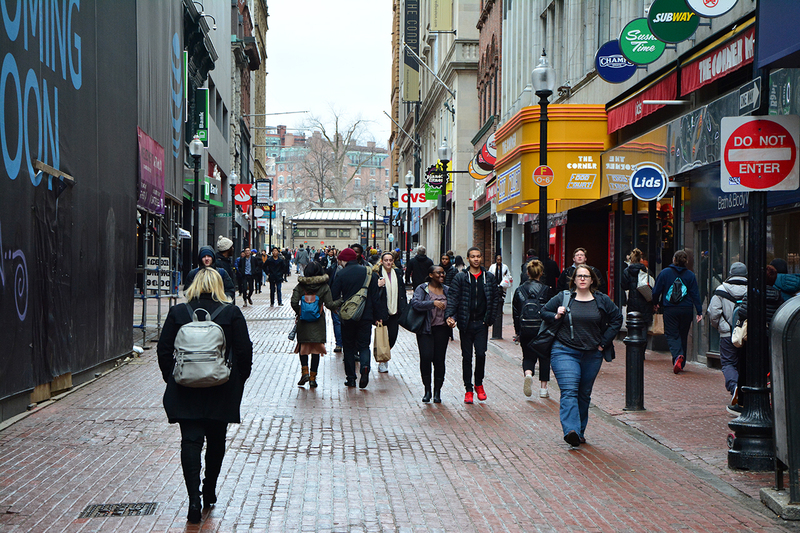 Because of the large number of businesses, the most common crime committed in Downtown Crossing is theft, followed by assault and vandalism. But perhaps the most serious threat to the neighborhood is the opioid crisis. This is a problem statewide. The Department of Public Health released figures for Massachusetts for the first nine months of 2017 and showed that there were already 932 confirmed opioid-related overdose deaths and another 491 to 582 estimated for the final three months. At the same time, the revival Downtown Crossing has experienced in the business and residential sector is creating positive change. It’s helped attract businesses, restaurants and, most importantly, people to make the neighborhood thrive. In many ways, Downtown Crossing and Chinatown feed off of each other. Each district helps the other by attracting customers, allowing for businesses to thrive. Visitors of Downtown Crossing can get authentic Asian cuisine while local businesses thrive off of the Asian market. According to Sauceda, approximately 13 percent of the Godfrey Hotel’s customer base is visiting Boston from Asia. 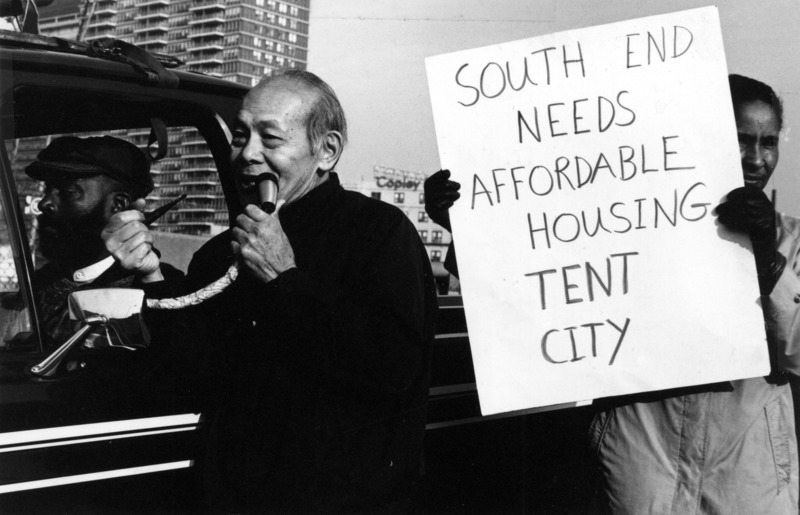 Next Next post: South End: Where have All the Activists Gone?